Selina Kyle (Catwoman) attempts to steal a valuable cat statue. Unbenownst to her, the object belongs to Katsu, a Japanese gangster. She fails, and Batman begins to track her. During a brief encounter with Batman, Catwoman steals his utility belt. Catwoman begins to experiment with the belt, which can remotely control many of Batman's valuable tools, such as his Bat Bot and Batmobile. Catwoman still has designs on the rare statue. Batman finds Catwoman by tracing the signal on the Batarang. A short while later, Batman and Catwoman find themselves together on Katsu's property, surrounded by a ninja security force. A good introduction to Catwoman that plays it safe. Not that playing it safe is a bad thing, they didn't want to put all their eggs in one basket and risk dropping it. I respect that they knew how much of a chance to take, it helped avoid a potential repeat of "The Cat and the Claw" fiasco. The chemistry that Bruce and Kyle show in this is actually really good, they feed off each other well. 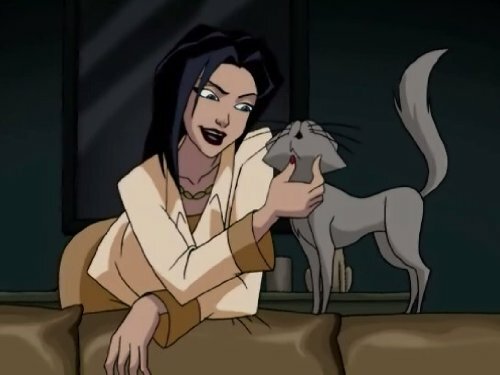 I'm just hoping they don't make Selina into a one-note character like "Batman: The Animated Series" did. "The New Batman Adventures" got her off on a better foot even if they only used her twice. But hey, it's only the 6th episode, so here's hoping that this series can make good use of her.